Orange Creamsicle Fudge is a bright & cheerful fudge candy that is great for holidays, such as Christmas or Easter. 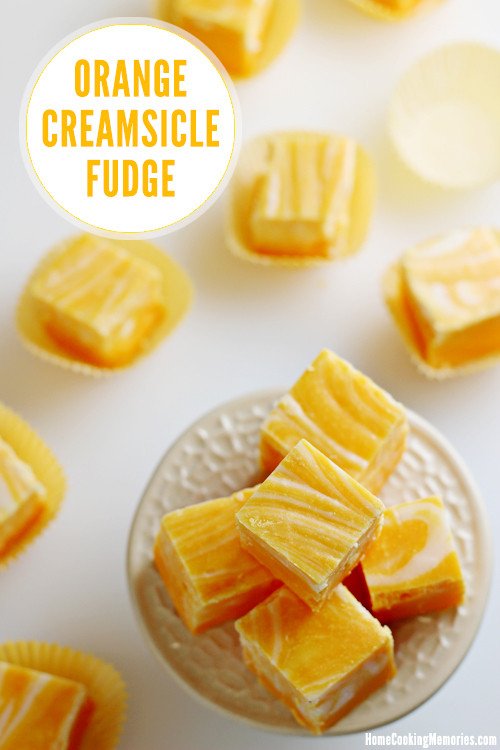 Its delightful flavor will remind you of frozen orange & cream bars (such as Creamsicles or 50/50 bars). Of all the treats during the holidays, the one I usually avoid the most is fudge. It’s not that I don’t like fudge, but it’s just that it’s sooo sweet. I’ll eat a piece or two, but I would be much happier sticking with cookies. Or other candies. But, my family? Most of them think fudge is the best thing ever. So, I make a variety or two and they are happy. And when they’re happy, I’m happy and it’s a win/win. All this was until I tried Orange Cream Fudge. I can’t even remember who gave it to us, but it was on a plate of assorted treats years ago. I loved the colors of it, and when I took a bite, I had the instant flavor of one of my favorite frozen treats: Orange Creamsicles. Or 50/50 Bars, as we’ve also called them. Now this was my kind of fudge! Yeah, it’s still sweet. So sweet. But that’s ok in this case. It’s a fairly easy fudge to make. The “hardest” part is getting a nice orange color, but it’s really not that difficult as long as you you add only small amounts of food coloring and don’t go crazy adding a bunch of red food color into it. 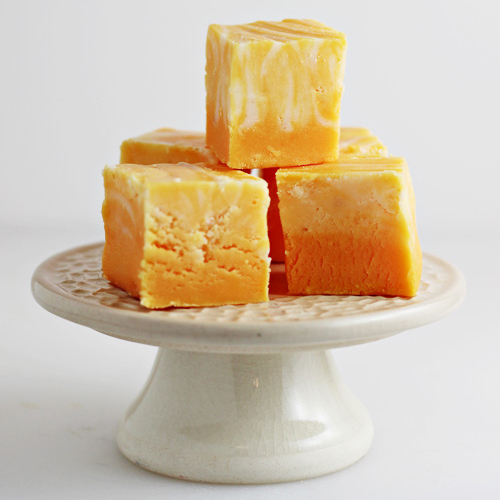 Speaking of the orange color — while I make this fudge for Christmas, it’s also great at Halloween and I think it’s lovely around Easter time too. Line an 8×8″ or 9×13″ baking pan with foil (the smaller pan with result in taller pieces, the larger size will result in thinner pieces). Spray with cooking spray. In a large saucepan, combine butter, sugar, whipping cream, and salt and heat over medium heat. Stir frequently until sugar is dissolved. When mixture comes to a boil, continue stirring for 4 minutes. Remove from heat and stir in chocolate chips and marshmallow cream. Stir until both are melted and mixture is smooth. Remove 1 cup of mixture and set aside. To the larger amount of mixture, stir in the orange extract and food coloring needed to achieve an orange color. Pour mixture into prepared baking dish. Place small spoonfuls of the reserved mixture on top of the orange mixture. Drag a butter knife through the white mixture spoonfuls and through the orange mixture to create a marbled look. Cover and refrigerate until set. Cut into squares to serve. followed recipe exactly…it turned into a big grainy lump…any clue as to what happened? I was so excited because my bonus daughter would love it but probably not so much now….expensive science experiment that was a mess…but on plus side, my kitchen smells like Florida!!! I thought this would have some orange flavoring in it, not just color. You can make this with any color. How about batches of red and green for Christmas? It actually does have orange flavoring it in — 1 tablespoon orange extract. You could certainly substitute that with another extract and, if you wish, make this fudge other colors. Love the Clear Glass Dressing And Sauce Bottles-Black Caps for homemade salad dressings! I would buy the glass jugs and maple syrup bottles! Great idea! I love fruity fudge! I would buy the spray bottles, aqua glass vials, and the aluminum water bottles! I love them in their many sizes/configurations! Oh em gee, this is freaking gorgeous. I cannot stop staring at it. It has me mesmerized. Perfect for the holidays. Thank you so much for joining us this week. This looks SO good. It is going on my list of goodies to make this week. We love creamsicle anything! Can’ wait to try this! I need some orange cream fudge! I am a fudge lover because I love the sweets in a very big way. This is going on my to do list! Orange creamsicle is a flavor that I don’t get all excited about when I hear it but I go bonkers when it’s right in front of me! Now that is one gorgeous fudge. Creamsicles are so delicious. I am going to put this one on my goodie plates next year. Definitely storage containers and shelving!! Okay to die for fudge!!! I have to make this for sure!! I would buy a whole variety of mason jars! So many metal tins and glass jars! I would buy the Airseal Jars with the blue lids.